If you have diabetes type 2 or type 1 and are wondering what foods you can eat with your condition and not experience blood sugar spikes, then know that nuts and seeds are always a good choice. Except for maybe chestnuts, almost all common nut and seed varieties are low on the glycemic index. In fact, given their distinct nutritional makeup (low carb, high fat, high fiber, high protein), nuts and seeds in general have a glycemic index score of around 20, a very low value, competing with some of the lowest glycemic fruits and vegetables. 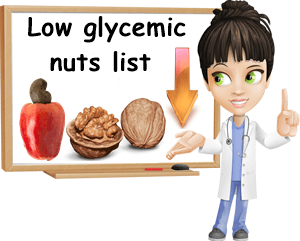 Our list of 10 low glycemic nuts and seeds includes almonds, Brazil nuts, cashews, chestnuts, hazelnuts, Macadamia nuts, peanuts, pecans, pistachios and walnuts. From a culinary perspective, all of these options are nuts, but according to their botanical definitions they are, in fact, a mix of nuts, seeds and fruits. They can be eaten raw, dried, roasted or otherwise cooked, but are best consumed as close as possible to their natural state, preferably unsalted and unsweetened. If you choose roasted options, make sure they are dry roasted so as to not add to their already high energetic value. To derive the most benefits from these 10 low glycemic nuts and seeds, you can eat them either separate from or combined with other foods. Given their particularly low glycemic index and unique nutrition, when combined with other foods, whether fruits or vegetables, nuts and seeds help lower the glycemic values and effects on blood sugar of those other foods as well. But while their high fat, protein and fiber and low carbohydrate content contributes towards blood sugar control and diabetes management, nuts and seeds are also densely-caloric and can easily encourage weight gain. So remember to keep your intake modest in order to limit your calorie intake and avoid weight gain. What is the glycemic index? The glycemic index (GI) is a numerical scale that estimates the effects of foods on blood sugar. Depending on the amount and type of carbohydrates and other nutrients in a food (such as fat and protein affecting how carbohydrates are absorbed), foods get absorbed at different speeds, resulting in different rates of sugar absorption into the bloodstream. The glycemic index essentially measures how fast the carbohydrates in a food raise blood sugar. Below 55 is a low GI. Between 56-69 is a moderate GI. Between 70-100 is a high GI. And because nuts and seeds in general provide limited amounts of carbohydrates, that makes them generically low-glycemic. The glycemic index of almonds is fairly low, estimated to be around 15. 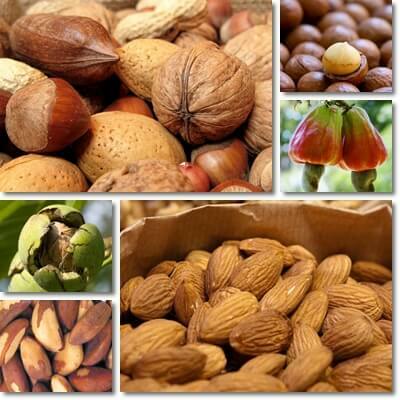 100 g of almonds has 21.55 g of carbohydrates, but 12.5 g are dietary fiber which helps with blood sugar control. Additionally, the same amount provides almost 50 g of fat and 21.5 g of protein to compensate for and limit the glycemic effects of the carbohydrates. Also, almonds are botanical seeds. Also see the 9 Benefits of Almonds for Diabetes. Official information regarding the glycemic index for Brazil nuts is not available at this time. But it’s clear the variety has less carbs than almonds (9-13 g of carbs per 100 g) and more fat and protein (60-66 g of fat and 12-13 g of protein per 100 g) – the different values account for variations in the nutritional status of the nuts. Less carbs and more fat and protein means reduced effects on blood sugar so it’s reasonable to assume that Brazil nuts glycemic index is also somewhere below 20, especially considering almonds have a GI score of only 15. Also, the variety is a botanical seed. The glycemic index for cashews ranges slightly, between 21 and 27 (lowest and highest values determined upon testing). The variation is acceptable since foods are not nutritionally identical, even foods of the same kind. Compared to other common nuts and seeds, cashews are slightly higher in carbohydrates and a bit lower in fiber, with over 30 g of carbohydrates and 3.3 of fiber per 100 g. They are also a bit lower in fat and protein at over 43 g per 100 g and below 20 g of protein per 100 g. Also, botanically, cashews are the seeds of the fruit known as the cashew apple. Also see these 12 Fantastic Benefits of Cashews for Diabetes. Note: Of all nuts and seeds, chestnuts are the ones best consumed with a little protein/fat to reduce their glycemic impact. Also, botanically speaking, chestnuts are true nuts. The edible part without the reddish-brown peel and thin, inner skin is the seed. The edible part together with the inedible reddish-brown peel and thin, inner skin is the nut. Like other nut varieties, hazelnuts are low GI. The glycemic index of hazelnuts is estimated to be somewhere between 15-25, in line with the GI values of other nuts and seeds. The variety provides over 16 g of carbohydrates, but is high in fiber (9.7 g), fat (around 60 g) and protein (around 15 g) – nutritional values for 100 g. A serving of one oz (28.35 g or the equivalent of 21 whole kernels) provides only 4.7 g of carbs of which 2.7 g dietary fiber, about 17.2 g of fat, 4.2 g of protein and 178 kcal. Botanically speaking, hazelnuts are true nuts. Macadamia nuts stand out for being extreme sources of dietary fat, with over 75 g of fat per 100 g and only about 13-14 g of carbohydrates of which over 8 g dietary fiber and about 8 g of protein. No official information regarding their GI score is available at present. But comparing the variety with other nuts and seeds, it’s clear that Macadamia nut nutrition favors minimal effects on blood sugar and a glycemic index score of around 20 or less. The glycemic index for peanuts is fairly low, ranking a GI score of only 14. Such a low score can be explained by a high fat and protein content (almost 50 g of fat and 25 g of protein per 100 g) and a reasonable carbohydrate, but high fiber content (around 16 g of carbs of which 8.5 g dietary fiber). Peanuts have all the makings of a low GI nut and are the botanical seeds of a legume (think beans, peas, chickpeas). Also see Can Diabetics Eat Peanut Butter? Pecans have less carbs than peanuts (about 13.9 g of carbs per 100 g of which 9.6 g dietary fiber) and about as much fat as Macadamia nuts (over 70 g of fat). Now, the average glycemic index for peanuts is 14, but pecans are even higher in fat than peanuts and fat is known to reduce the effects of a food on blood sugar. Even though the glycemic index for pecans is still unknown, it’s not unreasonable to assume its fairly low, lower than 20 at least. Botanically, pecans are the seeds of a fruit. Pistachios glycemic index score is estimated to be around 20. The nut variety is high in fat (over 45 g per 100 g) and protein (over 20 g per 100 g), but also relatively high in carbs (over 27 g per 100 g, but 8.9 g are dietary fiber which helps with blood sugar control). Pistachios are the seeds of a fruit. The glycemic index for English walnuts is around 20, a low score. High in fat (over 65 g per 100 g), protein (over 15 g per 100 g) and a moderate source of carbohydrates (over 13 g per 100 g), walnuts favor blood sugar control. Actually, because walnuts are lower in carbs than varieties like cashews and almonds (GI 20+, GI 15), but a lot higher in fat, it is not unreasonable to assume their GI score may fall lower than the estimated value (20).